As the elections are coming just about a week ahead of Diwali, a time for the biggest real estate launches, those tracking the sector say there could be some changes and delays in new projects. Maharashtra and Haryana, the two states headed for legislative Assembly elections on October 15, have another thing in common. They are among the most prominent property markets and together are estimated to constitute 30-40 per cent of the pan-India real estate universe. While the polls might not substantially impact the property prices in these states, these could slow down policy clearances and infrastructure projects critical to real estate, say analysts. Since the elections are coming just about a week ahead of Diwali, a time for the biggest real estate launches, those tracking the sector say there could be some changes and delays in new projects. There's likely to be a short-term impact on real estate activity and approval processes because of these elections, says Anshuman Magazine, chairman (South Asia), CBRE, a global consultancy in the sector. "It is usual for project approvals to come to a standstill before elections." Even proposed policy decisions such as overhaul of the floor-space index in Haryana is likely to be delayed, he said. Infrastructure projects in the states could also be hit, affecting real estate. A Cushman and Wakefield study put the total estimated unit launches at 172,500 across major eight cities of India in 2013. 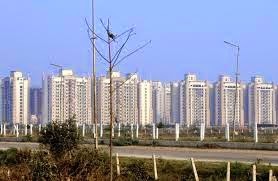 As for prime residential, Gurgaon made for 8,000 new apartment units in the first half of 2014, Mumbai 17,600 and Pune 5,000, according to CBRE data. Read More..